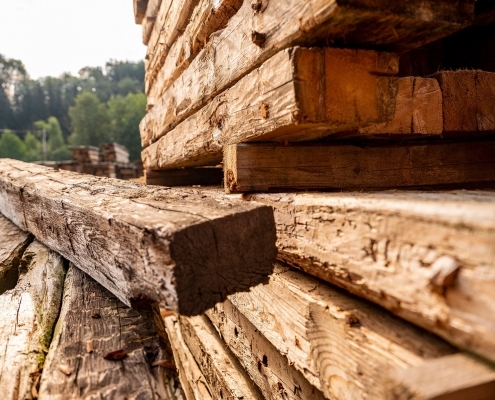 Benefit too from our comprehensive expertise in the antique wood boom. Kraftholz supplies old and used wood in different forms. Either as raw material directly from brokendown huts, farms, stables etc. Or professionally prepared for wall and ceiling coverings, floors, design objects etc. By careful examination of the stock material and professional processing with state-of-theart equipment and methods. Comprehensive expertise based on our multi-generation experience in wood processing since 1651. From demolition of huts, farms and stables to preparation and cutting into the desired form. Unique materials with history and character sourced without felling a tree. As true professionals, the antique wood experts at Kraftholz recognize high-quality salvage wood at first glance. In addition, they know exactly which refining processes to use to give these treasures a second life as floor, ceiling or wall covering, as a table or a stylish art object. For example, by treatment in a heat chamber or careful brushing and oiling to bring out the grain and colors even more. Another incentive for the use of waste wood is its sustainability. This applies both on an ecological and on an economic level. Ecological, because no tree has to be felled for resource recovery. Economical, because high-quality antique wood from Kraftholz retains or increases its value.